Have we skipped spring completely here in New York City? The beautiful weather this weekend seems to have erased the memories of 30 degree chilled winter days and skipped ahead to 80 degrees and sunny. Along with one of the first really nice weekends here in the Big Apple, comes all of it’s residents coming out of hibernation and walking around our little town. A must-go stop is Brooklyn Flea, a weekly flea market that swings by Williamsburg every Sunday (11AM to 5PM at 50 Kent. Ave) for all sorts of treasures and tastes. 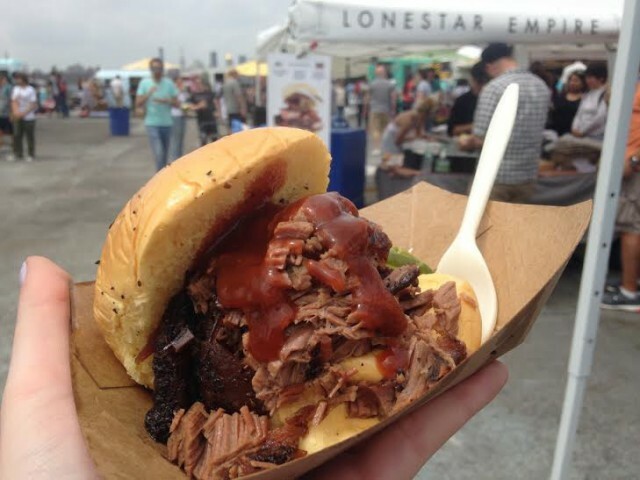 Today we couldn’t say no to a bite of Lonestar Empire, a slow smoked Texas-style brisket food stand that is carved right in front of you with some of the most tender meat you’ve ever seen (or tasted). 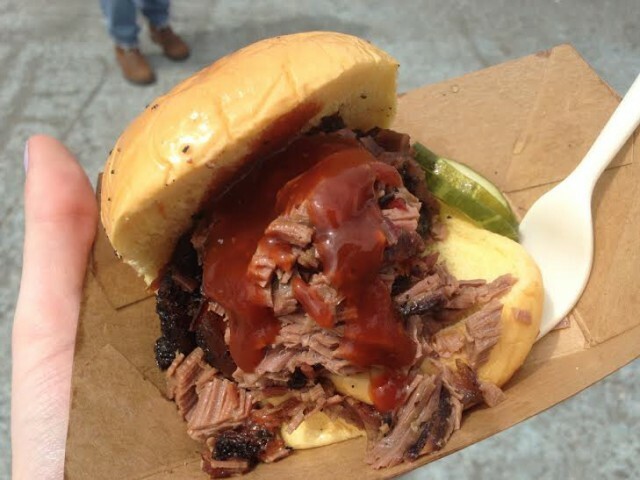 Slow smoked #Texas style brisket at #Brooklyn Flea today in #Williamsburg! A roll (with plenty of meat included) ran $9 with a option of some Texas-style potato salad for an additional $3. While my eyes were hungry for a side-dish, it as unnecessary with the one small sandwich filling me right up. Toppings for each roll included a big bottle of BBQ sauce (add as much as you’d like), white onions, pickles and jalapenos to garnish to your liking. So juicy and tender, Lonestar Empire was quite a treat. And the perfect bite of a sandwich to energize for some ore afternoon shopping at Brooklyn Flea or for a stroll down Williamsburg, without havig a food baby at the same time. No foo coma here folks, but to sandwiches would have done it for sure. Highly recommended to give a try if you happen to swing by Brooklyn Flea, Smorgasburg, or Summerstage soon. Tags: BBQ, BBQ sauce, Brisket, BROOKLYN, Brooklyn Flea, Market, pickles, smoked, Smoked meat, Texas-style, WILLIAMSBURG. Bookmark the permalink.